1. It's better to charge battery around 2-3 hours before using due to the long time of transportation, and the battery fully charge need about 2.5 hours. 2. It does not support 5ghz network. 3. APP can't support MAC system and windows phone. We will provide 6 months warranty,If the item does not work for you just let us know for we offer a FREE warranty on our products for any technical defects.Service Email: may@baiyutrade.com. Continuously recording mode,snapshoot of an event mode options to make recording, reviewing video and pictures easy. Residential & Business security uses:Real-time monitoring as Nanny cam, pet cam, Home Security Camera to keep an eye on your little baby and pets ,home security business monitoring. ✪Video: HD 1920*1080P/1280*720P/960*640 video resolution,snapshot shooting model; Frame Rate is 30fps; Video Format is AVI; 12 Million Pixels(4032*3024); Lens angle is 90°. ✪ADVANTAGE: Very small and tiny hidden camera; HD Video Record; Smart Motion Detection; Built-in 480 mAh lithium battery; Charging and operation can be carried out simultaneously; Supporting 128GB micro SD Card (Package not included SD card); Support multi user and multi device simultaneous connection; Client supports smart phones and windows systems. 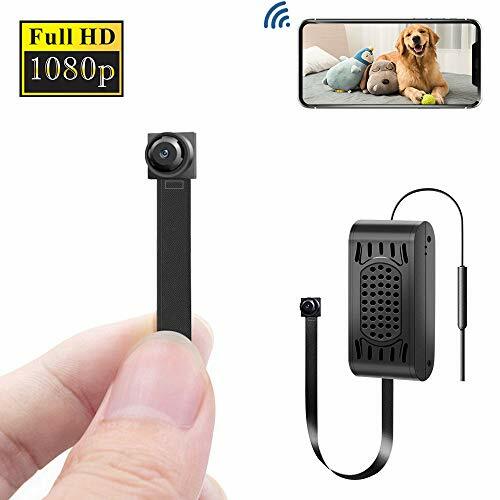 ✪WiFi Connection SPY Camera: There is no distance limitation for you to view or record live videos,when the camera is successfully configured and connected to your smartphone, you will be able to view live videos from anywhere at anytime as you desire. ✪Motion Detection: The mini camera is very small and tiny, you can place it anywhere to ensure the safety of your family and property; APP supports viewing of 4 live video at the same time and multi camera simultaneous connection; Smart motion detection, when a motion is detected camera will take pictures and recode video. ✪EASY TO SET UP: Download free app from "Google Play" or "App Store", add the device in just minutes. , the camera connected is easily and quickly; APP is simple and easy to use, you can use APP to watch live, record video, take the photo, timing record, all day record... And you can watch these videos or photos directly on your phone(Including motion detection video and picture). If you have any questions about this product by ENKLOV, contact us by completing and submitting the form below. If you are looking for a specif part number, please include it with your message.